Turn left ON SERRAMONTE BLVD. 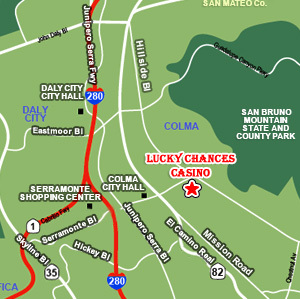 Go straight on SERRAMONTE BLVD until HILLSIDE BLVD. Proceed to 1700 Hillside Blvd. Turn left on OYSTER POINT BLVD. Go straight to SISTER CITIES BLVD. SISTER CITIES BLVD. becomes HILLSIDE BLVD. Cross Bay Bridge and head towards San Francisco Airport. Turn left on SOUTH AIRPORT BLVD. Right on SISTER CITIES BLVD. Turn right ON HICKEY BLVD. Left on JUNIPERO SERRA BLVD.